A presentation at the Insider’s Forum conference addressed a portfolio risk greater than volatility, and introduced a new way of looking at tax-aware investing. Like you, I’ve sat through a lot of investment sessions that didn’t really help me understand how to actually do a better job of investing. You might get prognostications, economic analyses and pitches for this or that investment philosophy, and leave no wiser than when you walked in the door. At our Insider’s Forum conference, we wanted an investment session that would provide not only great insights, but actionable ones, with out-of-the-box ideas that you could actually use when working with clients. We turned this weighty assignment over to Gibson Capital Management (founded by Roger Gibson) with a presentation by two of Roger’s brightest team members: Chris Sidoni and Chad Hileman. They did not disappoint. Sidoni, who is Gibson Capital’s chief investment officer, started the presentation by focusing on a risk to client portfolios that may be bigger than downside volatility: what he called “policy abandonment.” The risk can be simply defined as: when the markets go down and clients abandon their strategy (selling out of equities), they lock in losses and suffer much more damage than the temporary losses suffered by investors who hold on through the recovery. Interestingly, Sidoni showed us that there are many scenarios that can give rise to strategy abandonment that don’t directly involve volatility. 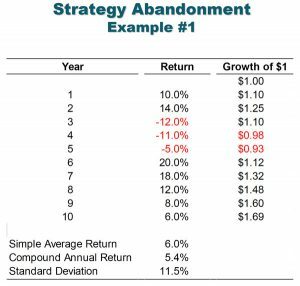 For instance, consider the Example #1 slide, where a client received, over 10 years, exactly what the advisor projected in his portfolio: a 6.0% simple average return, a 5.4% compound return, and a standard deviation of 11.5%. Also notice, in the far-right column, which measures the growth of a dollar invested, the portfolio breached what Sidoni described as an important psychological threshold. Its value dropped below what the couple started with. “Both of these things can cause strategy abandonment,” said Sidoni. This portfolio met the criteria that the advisor and client had modeled together, but the results were terrible because the client was sitting on the sidelines during the recovery period in years 6-10. Now look at Example #2, where there is far less volatility. This illustrates what Sidoni called the fatigue syndrome, where an impatient client is meeting with the advisor every quarter, and eventually starts wondering, why am I paying you fees when I could have been ahead with CDs or Treasuries? Here again, the portfolio breaches that threshold where its value is less than the client started with, and the client leaves the advisor and abandons the policy right before the market takes off with a big recovery. Finally, Sidoni showed Example #3, where we see two competing portfolios that demonstrate how clients might be evaluating their results intra-horizon. 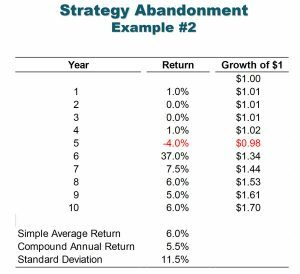 Note, at the bottom of the slide, that Portfolio A delivers a higher compound annual return with a lower standard deviation than Portfolio B.
Sidoni invited us to look at the results after year 5. “Portfolio B is ahead by more than 5% compounded,” he pointed out, “and it wins every single year over the first five years.” Wouldn’t clients in Portfolio A—which represented a diversified portfolio—compare their returns to Portfolio B (all U.S. stocks), and by the end of that fifth year, decide they wanted to shift to a “superior” strategy? And, of course, by shifting, they end up with a return experience that is lower than a buy-and-hold investor would have gotten from either Portfolio A or Portfolio B over the full ten years. So what do you do about this risk that is more dangerous than simple market volatility? In the initial meetings, and sometimes in mid-stream, Sidoni and his team will stress-test different alternative portfolios using a tool Sidoni and Gibson created, which is online and free to the advisory community—called Portfolio Simulator (https://www.gibsoncapital.com/professionals). Portfolio Simulator shows the year-by-year trajectory of total portfolio returns for different asset mixes over various time periods—allowing advisors to stress clients the way they stress-test portfolios. In the presentation, Sidoni showed two portfolios that he was offering for client approval, one with a higher equity allocation than the other. Then he used the Portfolio Simulator to look at the past performance of the two portfolios. The riskier one dipped below the original value in 2008. Warning! But as clients were watching the riskier simulated portfolio drop below what they started with, Sidoni continued the simulation, and that riskier portfolio delivered a higher return over time. Sidoni offered a simulation showing an all-stock portfolio vs. a more diversified approach, stress-testing the alternatives from 1994 through 2007. “In that whole time period, those portfolios ended at basically the same spot,” he pointed out. “But if I stop in 1999, it is a very different experience. The domestic portfolio outperforms by a huge margin, and did so basically every single year.” Of course, if clients had abandoned diversification in 1999, they would have gotten killed in the subsequent downturn. Up next, co-presenter Chad Hileman, director of Investment Research at Gibson Capital Management, who took the audience completely out of the normal investing box. The topic was tax-aware portfolio design. But most advisors act on that statement by buying muni bonds to provide fixed income in taxable portfolios and engaging in tax-loss harvesting toward the end of the year. Hileman took the concept much further. To see how, consider two clients, one living in a no-state-income tax state like Florida, the other in a high income tax state like California. Further, the Florida-based client has all her investments in tax-sheltered accounts (an IRA, let’s say) while the California-based client’s assets reside in a taxable account. The difference in marginal income tax rates is enormous. Normally, if the two clients are roughly the same age, with roughly the same risk tolerance and roughly the same investment goals, they would receive roughly the same asset allocation recommendations from their advisor. Right? But Hileman showed that in his process, incorporating tax-aware return assumptions, the recommended portfolios would be very different. Look at the slide entitled Tax-Aware Return Assumptions to see why. You see three fixed-income assets, two stock and one real estate asset that are candidates for inclusion in client portfolios. Hileman’s estimated return column is taken directly from JPMorgan’s capital market assumptions—and you see in the “total yield” column that the return and yield are identical for the three fixed income investments. Next column, you see that he assumes that all of this will be taxable as ordinary income (nothing too complicated here), and moving to the right, you see that there will be no qualified dividends, no capital gain distributions and no price appreciation. The tax drag is calculated as the client’s ordinary income rate at the top of the chart multiplied by the yield. Subtract that from the yield, and you get (last column) the estimated after-tax return of each investment option. The other assets provide a more complicated calculation to arrive at the tax drag and after-tax return. U.S. stocks are assumed to return 6.41% a year (if you disagree with that, take it up with JPMorgan), of which 2% will be qualified dividends. There will be a relatively minor 0.25% capital gain distribution (Hileman is assuming index funds or index ETFs), and the price appreciation column is just the difference between the total return and the two taxable distributions. The tax drag is the client’s qualified dividend tax rate (top of the screen) multiplied by the yield plus distribution, and the after-tax return is the difference between the return and the tax drag. Non-U.S. stocks are assumed to be less efficient because only 80% of the dividends will be taxed as qualified dividends, and there is a higher capital gain distribution. REITs generate a higher proportion of their return as income, and Hileman assumes that 70% of it will be taxed as ordinary income. This rather laborious process produces the California client’s after-tax expected returns from each asset. The reader is invited to notice how different they are from the pre-tax return that someone would receive if there were no state income taxes and the money was in taxable accounts. Two things to note before we go further: Hileman spent a long time looking at the different assets in client portfolios in order to come up with the average size of the yield compared with the returns, the percent that is, on average, taxed as ordinary income and qualified dividends, and the amount of capital gains distributions. The reader can make your own assumptions, however, when reproducing this spreadsheet. And second: at the top, you can customize the ordinary income tax rate and qualified dividend rate for each client. This exercise can be customized for each of your clients. But what’s the point? Hileman showed that if you’re ignoring taxes, and simply creating an efficient portfolio allocation without taking into account the very different after-tax returns for that taxable investor, you will be overweighting tax-inefficient investments like high-yield bonds and REITs, and underweighting relatively tax-efficient investments like core bonds and U.S. stocks. Put another way, if you were using an optimizer, and you input the raw expected returns, you would get a very different portfolio recommendation than if you input the after-tax returns. Hileman showed the audience a slide which illustrated a plausible portfolio mix using pre-tax numbers, compared (on the right side) with a tax-aware asset allocation. 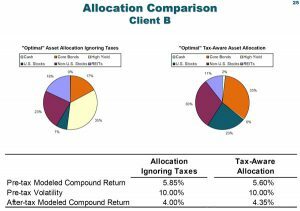 The key statistics in “Allocation Comparison, Client B” are the pre-tax modeled compound return (slightly higher for the portfolio design that ignores taxes), and the after-tax modeled compound return. Few of your clients will have 100% of their assets in an IRA—or 0%. What do you do when clients have the capacity to allocate both to a tax-deferring IRA and a taxable account? Hileman showed the audience a model where you would treat each asset class as if it were two different asset classes, one pre-tax and the other after-tax. The pre-tax version of each asset would be applicable to the IRA vehicle, while the after-tax would be applicable to the taxable portfolio. “Let’s say that a client has 20% of his money in a tax-sheltered account,” Hileman proposed, “and the advisor wants to recommend that 50% of the portfolio be in tax-inefficient assets.” A joint optimization process starts by creating an asset allocation ignoring the impact of taxes–the same allocation that we saw earlier. “The next step is the asset location step,” Hileman told the group. “We know that high-yield bonds are the most tax-inefficient asset in the portfolio, so let’s fill up the IRA account with the high-yield bonds.” Then you would look at the other after-tax return calculation for high-yield bonds, and see if it makes sense to include them in the taxable portfolio compared with other investment opportunities. 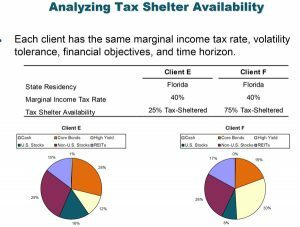 To see how this might work, Hileman imagined two clients living in Florida, one of whom has 25% of her portfolio in an IRA, while the other happens to have 75% in a tax-deferred vehicle. You can see in the slide that the yellow slice of the pie graphs are very different; the client with more IRA capacity (the one on the right) will have a meaningfully higher allocation to high-yield bonds than her counterpart. But both portfolios are created using a mean-variance optimization process, which means that all asset classes are able to fight for a place in the IRA and the taxable account based on their assumed risk/return characteristics. The audience asked a number of questions about how to apply this information in the real world. 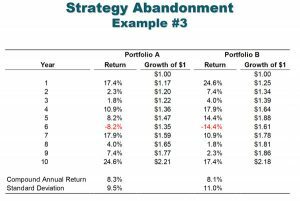 Does Gibson Capital really use optimizers (mean return/variance calculation engines) when creating client portfolios? Yes and no; the portfolios are tested using mean/variance calculations. But Hileman and Sidoni noted that they know of no mean/variance calculation engine that will optimize asset location and portfolio design using after-tax return assumptions. Mean/variance calculations include volatility assumptions. Does Hileman adjust the standard deviation assumption proportionately downward when downsizing the return assumption due to the tax drag? Answer: yes, but this is at best a crude estimate. Does anybody have a better idea? Has Hileman performed the optimization analysis through a withdrawal period, when liquidation will trigger capital gains taxes not included in his initial spreadsheet? The answer: yes. This does lower after-tax returns, because it raises the tax drag. But Hileman said that he was surprised to discover that liquidation doesn’t meaningfully change the results from the optimization process. There was an audible buzz at the end of this presentation, as advisors talked to each other about how they might use this technique in client portfolios. Since the conference was held in California, the discussion about minimizing tax drag enjoyed a particular emphasis. I hope somebody will invent a tool which will allow advisors to incorporate tax-aware assumptions as well as the tax-indifferent assumptions that are appropriate for IRA and Roth accounts. And I suspect that the more advisors think about how to create more tax-aware portfolios, this kind of thinking will become mainstream. It’s hard to justify leaving 35 basis points on the table each year.